The best cover acts serve as clarifying lenses through which to view the musicians they honor. 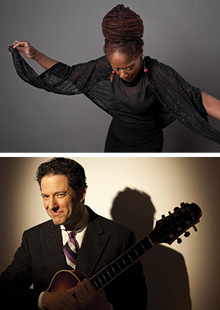 Such is the case with Catherine Russell and John Pizzarelli’s A Salute to Billie Holiday & Frank Sinatra. Russell, who has been called “a legend hiding in plain sight,” and Pizzarelli, who’s been dubbed “hip with a wink,” embody the legends they cover, in a program that is part tribute and part personal introduction to the people who made this music famous. Underwritten by Robin Black; Mary and Tim Mitchell.